Catalina Coastal Tours and Fishing awarded $239,000 city subsidy. AVALON —Boaters with vessels moored in Avalon Harbor can now catch a ride aboard a new shoreboat service. Avalon’s City Council awarded Catalina Coastal Tours and Fishing the water taxi service. “A Request For Proposals (RFP) was issued and the city awarded the RFP to Catalina Coastal Tours and Fishing,” Harbormaster Brian Bray confirmed. The city of Avalon called for an RFP in December 2016 from companies willing and able to offer shoreboat services; it was the second time an RFP for shoreboat service was issued. The city issued the first RFP in March 2016 and initially received only one bid from Island Enterprise. Avalon received three bids this time of which two, Catalina Coastal Tours and Fishing as well as Island Enterprises, met the RFP requirements. The city was offering a maximum subsidy in the amount of $250,000 for a shoreboat service. “The City Council awarded Shore Boat service to Catalina Coastal Tours and Fishing for the period March 1, 2017-February 28, 2022, with an operating subsidy from the city of Avalon of $239,000 per year based on performance standards set in the RFP,” Avalon City Manager David Jinkens stated in an email to The Log. Island Enterprises raised its initial bid of $500,000 to $800,000. The owner of Island Enterprises, Jeff Stickler, explained the shoreboat service had been running on a deficit. He also took into consideration costs for liability, legal fees as well as Americans With Disabilities (ADA) compliances. Island Enterprises had provided shoreboat services in Avalon Harbor for the past 40 years, but stopped its shoreboat service earlier this year, according to Jinkens. “Island Enterprises who operated the shoreboat service in Avalon started running reduced hours in November 2015. While the shoreboat was not running, the Harbor Patrol would transport passengers, so service was ALWAYS available,” Bray assured The Log. According to one captain on the island, the Harbor Patrol was the only one providing rides on harbor patrol boats to people needing to get to and from their moored boat. “Basically when the season ended, they [Island Enterprise] stopped their lease service. They still provided some weekends and holidays up to a certain point. Then they couldn’t reach an agreement with the city, so they pulled out entirely and stopped. They took all the boats out of the harbor and they sold some already,” Capt. Alison Osinski, owner of Aquatic Consulting Services in Avalon, stated. Osinski also pointed out the company who ran the shoreboat service for years sold discount ticket books. Now those tickets are no longer any good. In regards to the new shoreboat service, Catalina Coastal Tours and Fishing will have two custom-built, U.S. Coast Guard certified WingCat boats. 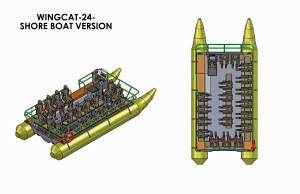 These lightweight 24-foot long inflatable boats will be able to carry 19 to 21 passengers. The boats are expected to be ready in time for the summer season, according to Capt. Scott Gorelczenko who owns Catalina Coastal Tours and Fishing with his wife Sharon. In the interim, Catalina Coastal Tours and Fishing will be using the existing fleet of three six-pack boats to provide the shoreboat service. 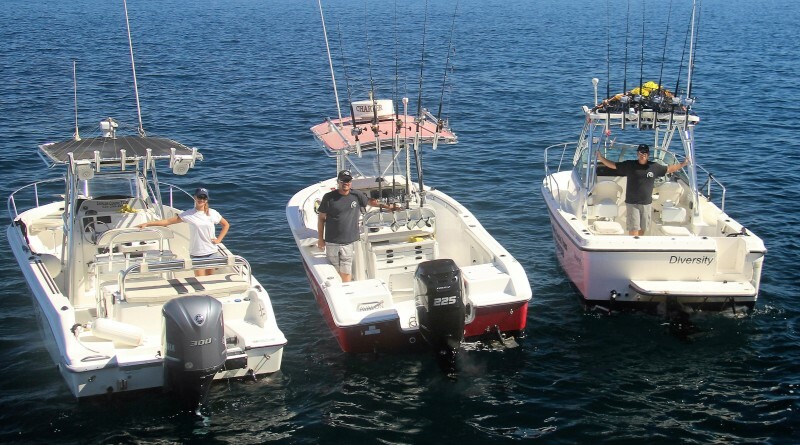 The company has been providing fishing charters, private charters as well as dolphin and sea lion tours in Catalina Island for the past four years. This is the first time the city of Avalon is subsidizing the shoreboat service in its harbor. Congratulations to the winner “Catalina Coastal Tours and Fishing”. Great to have a new service for shoreboat old drivers were mean and reckless, putting swimmers in harms way. Hope the new boats have a reduced wake. I shall miss the familiar retro boats that have been safely transporting passengers for years. The suggestion to charge a bit more to an already to expensive a mooring was a good one. However, I’d like to suggest that the shoreboat to be included in that rental or certainly not much more. This would eliminate the overcrowding of the dinghy docks and invite more people to come ashore to spend money. If memory serves me right 30 years ago it was much harder to get a mooring than it is today.